It's always interesting to work with elements that are a little out of my comfort zone. Today, I'm tackling two of them - the color red and crookedness. Ha! I have a slight aversion to the color red. I really have no idea why! (I promise that my mom didn't force me to wear it as a child - at least I don't think so!) I'm not sure if you've noticed, but Real Red is a color I rarely ever use. It does help to have it mixed with some colors that I DO like though - Yellow and Brown. Love them! And, you probably didn't know this, but I'm also a little strange about tilting things. I happen to like things straight and square. I usually stay away from sketches that include a tilted element. Funny huh! The tilt in this card happened by complete accident, but I think I kind of like it! 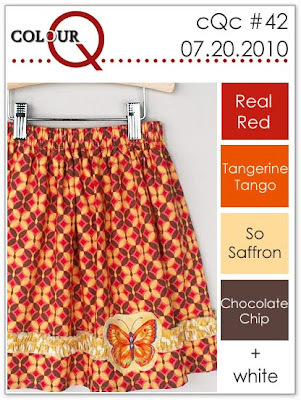 Check out this fun (but rather red) skirt for today's ColourQ challenge. I started off with a So Saffron base and stamped my new Pretty Pattern on it in Real Red ink. I carefully colored in each section with Chocolate Chip and Real Red Stampin' Write markers. I think I would have liked a little more color in the background, but I just wasn't sure exactly how to achieve this... Anyway, I then stamped a sentiment from my PTI Signature Greetings set on Real Red card stock. The piece of Chocolate Chip card stock, stamped with A to Z was actually an extra scrap sitting on my desk. I happened to lay my sentiment onto it by chance and found that it was a great match! Even the crookedness worked! Next, I stamped some little butterflies from my Flight of the Butterfly set with some Summer Sun ink on some Twill tape. I bunched it up on my card - one of my favorite ribbon techniques then added a So Saffron butterfly stamped with Tangerine Tango polka dots. Just an update on my supplies, in case you were interested and following my blog: I'm back home for a couple of days, which is why you see ample supplies used on this card. Tomorrow, we hit the road again to go back to visiting my family for the summer. We had to come back home for a quick trip for some meetings and a presentation. During this time, I restocked my paper, but kept many of the same supplies in my bag. So we'll be back to minimalist stamping (which you'd know really isn't the case at all, if you saw my craft bag crammed with stuff!). Hi Nina! what a lovely card! Thanks for playing the CQC! Pretty! The butterfly and ribbon treatment are great!